The keyboard is an essential part of our smartphone, therefore, having a good keyboard is a necessity. With a good keyboard app, you can have a good typing experience. It saves time and reduces the number of errors. In the era of the smartphone, there are many Keyboard’ apps. While selecting a keyboard app, the most important issue is security. As everything one type with the help of keyboard is recorded. Therefore, the keyboard should be such secure so that the user need not to worry about the stealing you emails’ information or passwords. So, you should always install trusted apps. There are many Android keyboards. Some of the best keyboard apps for Android are listed below. If you were looking for keyboards for Android, you can take a look at the list below. The Google Company has made the Android keyboard with a very simple interface. It has a ton of languages, text-to-speech, gesture typing, material design themes and a lot more. In short, it is a complete package with a clean interface. Google keyboard is the first keyboard to feature the full library of KitKat emoji. It also learns from the typing of the user. The Google keyboard is of free of cost which is available on Google Play Store. It is compatible with devices running Android 4.4 and above versions. If your device has Android 4.4 or higher, you do not need to go for other keyboard apps for Android. Another most well-known keyboard app that is available in the Google Play Store is the Swiftkey. It has one of the finest interfaces available on Android. Many phones and tablet have preinstalled Swiftkey app. 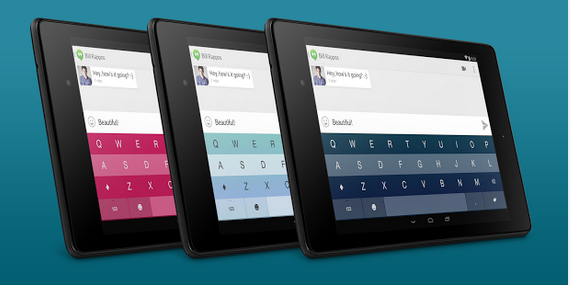 It has the similar feature of swipe as of Swype keyboard but swiftkey calls it ‘flow’. 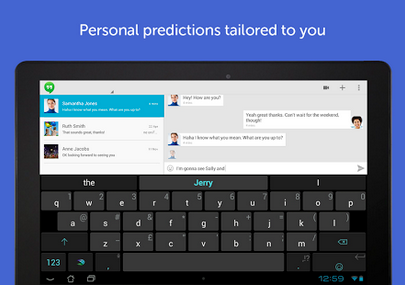 Swiftkey’s prediction method is known as ‘fluency engine’ which attracts its users. There are many options for keyboard size and layout including an intriguing ‘thumb’ mode. This thumb mode creates a space in between the left and right half of the keyboard. Swiftkey used to be paid app but now it is a free app since last year. 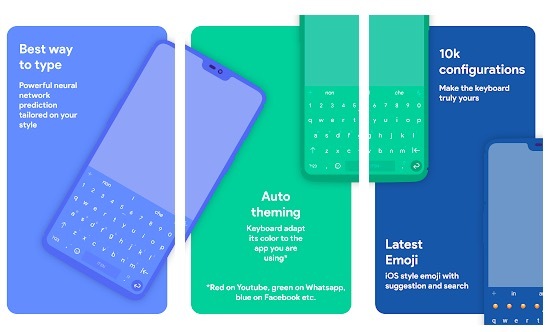 The themes for the keyboard have price. 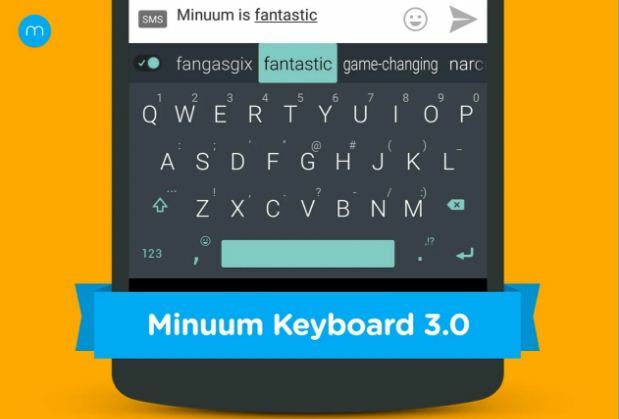 Minuum is one of the best keyboard apps and it offers minimal experience. It supports QWERTY, AZERTY and “A-Z” layout. This app takes the QWERTY keyboard layout and breaks it into a single row so that one can use a maximum of device’s screen. This app also offers cursor control, clipboard control, emoji support and more. It supports multiple languages like English, French, Spanish and many more. This app offers the voice to text typing experience via Google Voice Typing. It also gives you Smart Emoji suggestions. The app is compatible with Android devices running on Android 4.0 and up. It offers a free trial for 30 days. After the trial expires, you will have to buy the full version. The TouchPal keyboard is not a very popular one but has many useful features in it. It features over 85 languages, focused on emoji/emoji art/smiley/pictures, swipe and cloud prediction, and contextual prediction. It is available for free but the themes of the keyboard come with a cost. You have also an option to upload an image as a background and that too is free. The app supports ads, but the ads free version costs $2 for a year. The Flesky does not have the swiping features. It basically focuses on speed and accuracy, with large buttons and brilliant autocorrect. This app is extremely user-friendly. It has the ability to shrink the keyboard and even makes it invisible. With this invisible keyboard, it works in a very cool way. It delivers accurate typing with its default button size. It has a feature of swipe up and swipes down functions for adding and correcting new words in its dictionary. 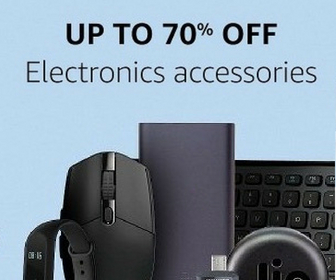 With these great features, it is not a cheap keyboard. It has a 30-days trial period which you can enjoy for free. If you like this app, you can go for the premium version of the app which costs $1.99. 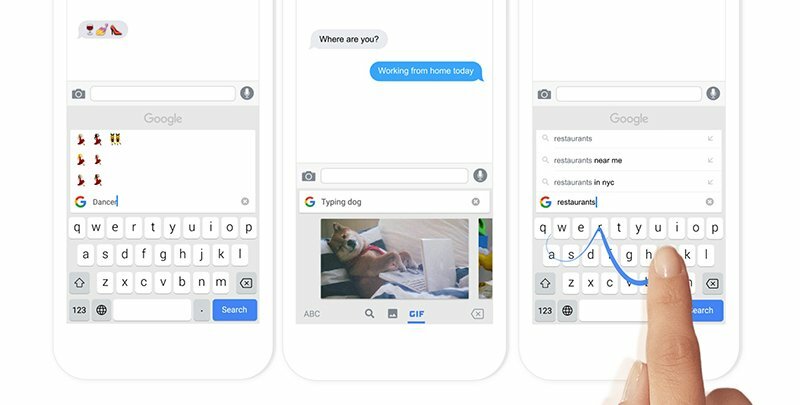 Chrooma Keyboard is similar to Gboard keyboard app but offers more customizable options the that. The keyboard app comes with features like swipe typing, gesture typing, keyboard resizing, predictive typing and auto correct. 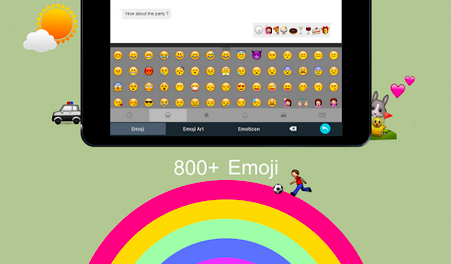 It also offers emojis, numbers and punctuations suggestions using neural action row. The app comes with an adaptive theme and GIF search option. It also allows Multilanguage typing and comes with One Hand Mode. It also has a Night mode feature that changes the color tone of the keyboard when enabled. You can also set the timer for enabling night mode. It can also automatically adapt the color scheme of the app you are using. So, it feels like the keyboard is the part of the app. Go Keyboard is also one of the best keyboard apps you can use to replace the default keyboard app of your phone. The app has a minimal design and can improve your typing experience. It supports a variety of languages. It also comes with integrated dictionaries to tell you the meaning of any word in any language. The app learns from you. The more you use it, the more it learns from your habits and improves it. It is smart enough to recognize mistyping, provide correction suggestions and make your typing easy. 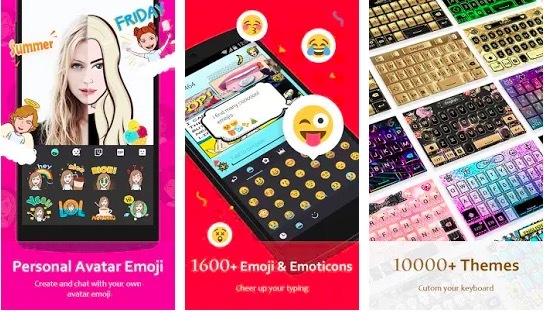 Go Keyboard offers over 1000 different themes, emojis, GIFs, fonts, etc. It has over 800 emoticons and 100+ fonts. It also offers features like swipe-to-unlock lock screen and charge mode. The app is free but contains ads. There are also some in-app purchases. Hope you got your best keyboard app for Android. Please, do tell us in comments below about your experiences on Android keyboard app. You can share with us about any other keyboard app which is better than apps listed here.